Build immersive and engaging AR apps in ARKit! Use Apple’s ARKit framework to build immersive and engaging AR apps! ARKit is Apple’s mobile AR development framework. With it, you can create an immersive, engaging experience, mixing virtual 2D and 3D content with the live camera feed of the world around you. What sets ARKit apart from other AR frameworks, such as Vuforia, is that ARKit performs markerless tracking. ARKit instantly transforms any Apple device with an A9 or higher processor into a markerless AR-capable device. At this very moment, millions of Apple users already have a sophisticated AR device right in their pockets! If you’ve worked with any of Apple’s other frameworks, you’re probably expecting that it will take a long time to get things working. But with ARKit, it only takes a few lines of code — ARKit does most of the the heavy lifting for you, so you can focus on what’s important: creating an immersive and engaging AR experience. 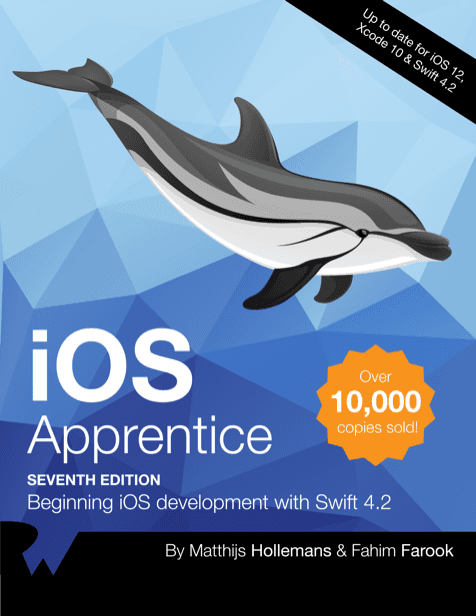 In this book, you’ll work through a number of polished and engaging apps: a tabletop poker dice game, an immersive sci-fi portal, a 3D face-tracking mask app, a location-based AR ad network, a monster truck simulation with realistic vehicle physics, a 2D and 3D object recognition and tracking app, and more! 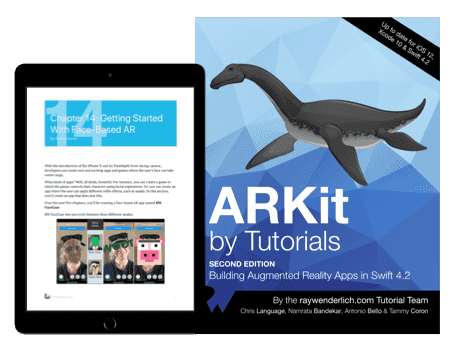 Welcome to the first section of the book where you’ll get your feet wet by learning all about the amazing power of ARKit. With ARKit, it only takes a few lines of code to start creating AR apps. ARKit does most of the the heavy lifting for you, so you can focus on what’s important: creating an immersive and engaging AR experience. In this chapter, you’ll take a look at what ARKit can do for you. It’s time to create your first ARKit application using Xcode’s built-in ARKit application template. You’ll also modify your app to accommodate basic UI elements, like labels and buttons, to provide user feedback and receive user input. In this chapter, you’ll learn all about AR sessions and how to manage them. You’ll also learn how to handle session errors and tracking issues that may occur during a typical AR application’s lifecycle. In this chapter, you’ll learn how to import, convert, texture and load 3D objects. Then you’ll learn how to place those objects into augmented space. You’ll start with an overview of 3D model materials by seeing how to create a virtual Earth. Then you’ll dive into building the poker dice game. In this chapter, you’ll learn how to detect real-world surfaces and how to properly manage updates to those surfaces. You’ll also learn how to create a focus cursor that will place itself on top of the detected surfaces through ray casting. Physics adds another level of realism. In this chapter, you’ll learn all about physics, how to configure physics and how to apply physics to your virtual objects. You’ll also learn how to reach into the augmented world and interact with your virtual objects. Over the next three chapters, you’ll implement a portal app using ARKit and SceneKit. You can use Portal apps for educational purposes, like a virtual tour of the solar system from space, or for more leisurely activities, like enjoying a virtual beach vacation. Now that you’ve gone through the basics of ARKit and how to integrate it into your apps, you’ll put this knowledge to work. In this section, you’ll implement a portal app using ARKit and SceneKit. Portal apps can be used for educational purposes, like a virtual tour the solar system from space, or for more leisurely activities, like enjoying a virtual beach vacation. In this chapter, you’re going to build up your app and add 3D virtual content to the camera scene via SceneKit. 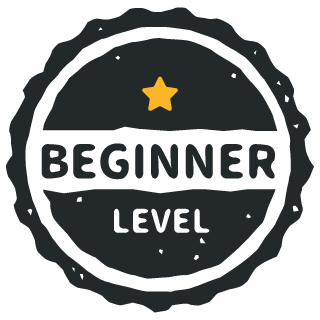 By the end of this chapter, you’ll know how to handle session interruptions and place objects on a detected horizontal plane. You learned how to add 3D objects to your portal scene with SceneKit. Now it’s time to put that knowledge to use and build a portal. In this chapter, you will learn how to create walls, a ceiling and a roof for your portal and adjust their position and rotation; make the inside of the portal look more realistic with different textures; and add lighting to your scene. AR has a plethora of business and utility use cases, indeed. How about a heads-up display on your windshield? Or a navigation app that paints your path ahead as you walk. Major brands currently use AR as preview tools for furniture and eyeglasses, distance meters, and many other things. Over the next four chapters, you’ll learn how to use ARKit, Vision, SpriteKit, SceneKit, Core Location and beacons to build an interactive billboard that you can use in a shop window to entice people with ads and promotions. There is no doubt that ARKit is a technology whose natural primary target is entertainment. But it’s no surprise that ARKit is versatile enough to be useful for business-oriented applications. In the next four chapters, you’ll learn how to use ARKit, SpriteKit, SceneKit, Core Location and beacons to build an interactive billboard that can be put in a shop window to tease people with ads and promotions. In the previous chapter, you learned how to detect a rectangle, how to take advantage of the Vision framework and how to turn a detected surface into an ARKit plane. However, you left the plane generation chapter with one outstanding issue: it’s not oriented correctly. You’ll fix that in this chapter. You’ll also "upgrade" the rectangle detection with QR code detection and you’ll add some user interaction too. In this chapter, you’ll learn how to improve the user interaction by using storyboards instead of standalone view controllers. You’ll also learn how to toggle fullscreen mode. In the final chapter of this section, you’ll learn how you can use location features to enrich the user experience by automatically enabling features when the user is near the place of interest. With the introduction of the iPhone X and its TrueDepth front-facing camera, developers can create new and exciting apps and games where the user’s face takes center stage. What kinds of apps? Well, all kinds, honestly! Perhaps a game where the player controls a character using only facial expressions. Or maybe an app that lets you apply cool selfie effects, such as responsive masks — or better yet, zombie makeup! In this section, you’ll create a face mask app — and as you might have guessed, it’ll include zombies. With the introduction of the iPhone X and its TrueDepth front-facing camera, developers can create new and exciting apps and games where the user’s face can take center stage. In this section, you’ll create an app where the user can apply different selfie effects — like a zombie mask! In the last chapter, you updated the starter project so that it includes a face-tracking session and a mechanism to handle session errors and interruptions. In this chapter, you’ll take things a step further by adding the necessary code to track a user’s face. In the last chapter, you updated the starter project and added code for tracking the user’s face. You also worked with face geometry and materials. But there’s a lot more to do with this project! If you haven’t created 3D content before, don’t freak out. You’ve got this! With SceneKit, you can create 3D designs right inside the SceneKit Scene file. So you’ve added Woot Glasses and Pig to your app. Along the way, you learned how to make your own 3D assets inside of a SceneKit Scene file using only primitive shapes. If you thought that was cool, wait until you turn Pig into an Animoji — which is exactly what you’ll be doing in this chapter. In this chapter, you’re going to add the ability to record and share your mask-wearing sessions using ReplayKit. This section focuses on game physics, an essential part of making your AR experiences even more believable. You pretty much know everything there is to know about ARKit by this point in the book. So it’s only fitting to flex your SceneKit muscles a bit, and create something really cool. SceneKit has got your back, because there’s some pretty decent Vehicle Physics already built-in. In the next two chapters, you’ll learn how to create an awesome remote controlled monster truck! This chapter continues where the previous one left off. Most of the vehicle physics side of things have been configured. What’s left to do is to spawn the truck into existence, then make it drive and steer, and add a bit of polish! ARKit 2 adds new features to Apple’s AR platform. This section explores two of those improvements and covers the basic building blocks for creating persistent and shared experiences for your AR apps. So far, you’ve built a basic ARKit app that can render realistic virtual content in real-life environments. But wouldn’t it be cool to pick up where you left off each time? That’s what you’ll cover in this chapter. You’ve learned how to update the ARSketch app to persist AR world map data between different app runs. Now learn how to send that captured world map data to another device and restore a world map sent from a completely different device. n this section, you’ll get an introduction to some of the new features released with ARKit 2, including the new file format, USDZ, and AR Quick Look. From there, you'll create an app that recognizes cards from a deck and tracks them as you move them around the table. Finally, you’ll discover what it takes to to detect 3D objects. Learn about Apple’s new USDZ file format and walk through converting 3D models into this new, universal format. After converting, you’ll explore integrating AR Quick Look into your existing web pages and apps to enable them to display USDZ content in stunning augmented reality. If you need a word to describe this chapter, here it is: detection. You'll learn how to detect 2D images and track their position when moving. You’ll also take a look at how to detect 3D objects. 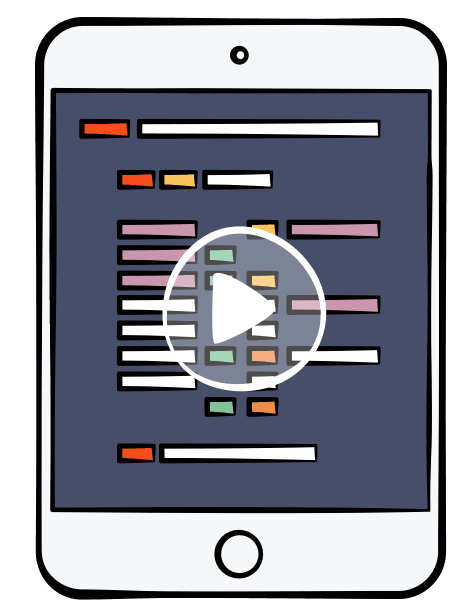 The largest and most up-to-date collection of development courses on iOS, Swift, Android, Kotlin, Unity, Server Side Swift, Unreal Engine and more.